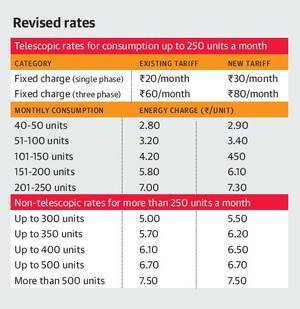 Kerala State Electricity Regulatory Commission has approved a hike in domestic power tariffs in Kerala from today onwards. The electricity rates will increase in the range of 10 to 50 paise per unit from 18 April 2017 onwards. BPL families with a connected load of 1,000 watts and monthly consumption of up to 40 units and agriculture sector have been exempted from the hike.